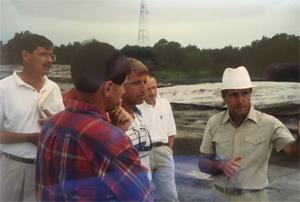 "Baytree National Golf Links will be perhaps one of Florida's best golf courses, and it was an honor to bring a Gary Player Signature Golf Course to Brevard County." 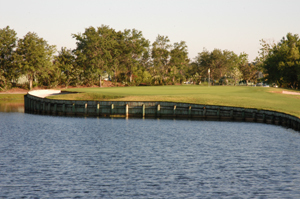 Built in 1992, the championship course at Baytree National was designed by the PGA's famous Black Knight, Gary Player. Mr. Player created generous and playable fairways for this Signature Course, mounded on the sides with moguls in a link style. You will not have players on parallel fairways hitting into you at Baytree National. 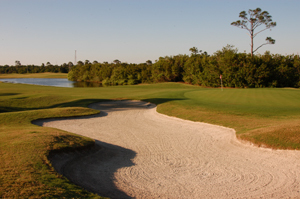 Playing at over 7,000 yards from the tips, Baytree is peppered with 82 white sand bunkers and the unique red shale coquina waste areas that have helped make Florida golf famous. The CHAMPION Dwarf Bermudagrass greens are of varying shapes and sizes that allow difficult, as well as easily accessible pin placements. 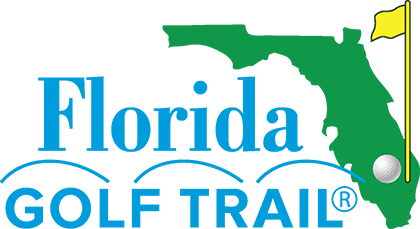 This course will definitely test your shot-making skills. You will walk away feeling that you have to return until you can conquer those lakes and wetlands on Player's exciting layout. 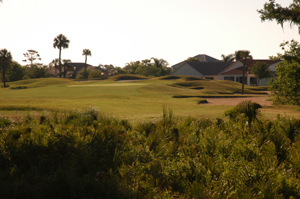 Your round will start on a par-4 (421 yards from the back, 286 from the front) that offers many of the obstacles that have made Baytree famous in Brevard County ~ water in play on the left, a large waste bunker on the right, and thick native shrubs and grasses threatening to swallow a wandering ball. Aim your drive down the right side toward the palm trees. The green will run away from you on the second shot and is guarded by a large bunker. The 5th hole, a long risk-reward par-5 (555 yards from the tips and 403 yards from the front) with bunkers down the right side and water to the left. The 6th hole is a par-4 with a split fairway that may puzzle you at first but this is an easy driving hole and you can play down either side. The second shot is the tough one because pin placement can require a change of clubs. If you come up short on your approach, you might have to deal with a series of sticky bunkers and two grassy hollows. The par-4, 9th hole (411 yards from the back and 295 from the front) is ranked as one of the hardest on the course. There is a tricky pond to the left of the tee boxes and the green is protected by bunkers on the right, and a large oak tree behind the green. 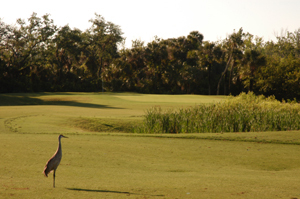 You need a good tee shot (drive toward the cupola on the clubhouse), and then take your approach shot to the green that's on the other side of the wetlands. You don't want to miss the green to the right; but you can miss left and chip it up. The heart of this course is found in the last five holes. The 14th hole, a par-4 that measures 416 yards from the tips and 286 from the front, is a fun hole that can wreak havoc on your score or it can be a short risk-reward experience. The hole is something of a double dogleg that goes right first, then left, then right again. Off the tee you can head right and end up with 125 to 150 yards to reach the green on your approach shot. Or take your tee shot to the left, carry a marsh in front of you and end up almost reaching the green, if you're a long hitter. Accuracy is imperative on hole 15, where your challenge is a very long, straight, and tough par-4, 447 yards from the back, and 297 from the front tees. Beware of the long pond to the left of the tee boxes that in some cases requires a shot over water to reach the fairway. There is a coquina waste bunker all down the left side of the fairway. The green has no bunkers, but it's two-tiered and slopes from back to front. Another risk-reward set-up awaits long hitters on the 16th hole. This par-5 measures 554 yards from the back and 408 from the front. Water is on the left hand side of the tee boxes, but if you go too far right, you could land in some treacherous fairway bunkers. A long tee shot can get you past the trouble so that you have a shot at a birdie. Be precise heading into the green which is flanked by bunkers and has water behind and off to the right. The 17th hole (209 yards from the back and 78 from the front) is a great par-3. It has a three-tiered green with a low front, plateau in the middle, and back that slopes away from you. There are also pot bunkers in the front as well as coquina. The final test is a par-4 (454 yards from the tips and 289 from the front). The marsh runs down the left side of the fairway and feeds into the lake which wraps around the left side of the green. It also plays into the wind. You can hit a risk-reward shot to the left over the marsh leaving yourself about 120 yards to the green. Or you can drive a safe right center shot. The final green is a small two-tiered green surrounded by water on the left and backside bunkers. After your round, be sure to stop by the Clubhouse and relax with a cold beverage.